I've shared with Y'all before how much I love the Journey Magazine. It is truly the best devotional I've ever read and it seems each one lately has been so timely and I can apply it to something going on in my life right now! As I opened up my new one for May I read an article written by the editor that I thought might interest some of you, too. It's all about ladybugs. Happy first day of May, Everybody! Wow! I didn't know that about Ladybugs. I'll be more respectful of them in the future! That is very interesting. Thank you for sharing this today...yes, we need to "bleed from our knees" more often...This week, May 3rd, is the National Day of Prayer...may we be on our knees for our nation and our leaders. Interesting about ladybugs. They are cute little critters and good for the garden. Very interesting thoughts on this. Always a new way to look at something, isn't there. Hope you are enjoying Spring. It has finally arrived here in Iowa too....and heading straight into summer it seems! How interesting!! Seeing a Ladybug down here is a rare thing but I will see them in a different way next time! 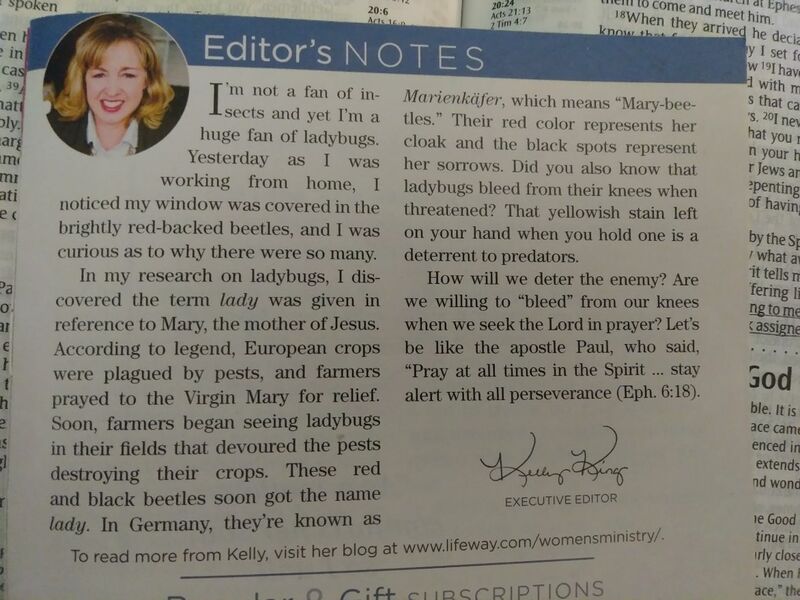 I didn't know this about lady bugs either. Great article and great analogy.